From August 14 – 19, 2011 I was in my favorite town of Moab, Utah. With several of eight local Moablive.com webcams in need of service and one new webcam to install, I had a busy week in Moab. Other than two brief thunderstorms, it was either warm or hot during my entire visit. When I left Moab at 3:00 AM on Friday morning, it was 76 degrees. Each day, downtown temperatures topped one hundred degrees . At the Moab Rim Campark, away from all of the concrete and asphalt, it was a bit cooler . On Tuesday, I visited Andy Nettell, proprietor at the back of the Back of Beyond Bookstore. A month earlier, our MoabBooks.com webcam server had failed. Luckily, the spare unit that I sent to Andy via UPS plugged right in and has worked flawlessly ever since. Next time you visit the bookstore, visit Andy’s antiquarian section at the back of the store. There you will see a red light flashing on our live webcam. 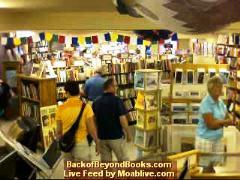 You can view that webcam live at MoabBooks.com. Stop by and wave to all of us out here. The world is watching. After retrieving the broken server from the bookstore, I headed over to Best Western Canyonlands Inn, intent upon getting wireless service connected to their webcam. With help from the friendly staff at the hotel, I was able to bypass their log-in screen and reconnect the Moab Canyonlands Inn “Center and Main” webcam. The webcam is located above the Peace Tree Café, in the new Main St. Suites at Canyonlands Inn. 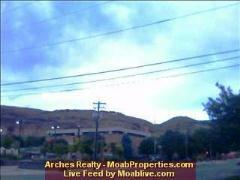 Now that their webcam is working properly, you can watch vehicular and foot traffic any time in Downtown Moab. The best place to watch is on the MoabInn.com website. 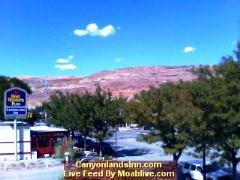 Soon, Canyonlands Inn will feature the webcam on their CanyonlandsInn.com website, as well. Next, I headed twelve miles north of town on U.S. Highway 191. My destination was Canyonlands Field, also known as the Moab Airport. 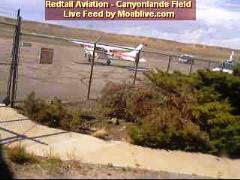 There, at Redtail Aviation, we have a live webcam pointing out the window of their hanger. Its field of view includes the arrival/departure area for Great Lakes Airlines, as well as the parking area for visiting private jets. Mr. Chris Bracken, pilot and mechanic for Redtail Aviation was working in the hanger that afternoon. He offered moral support as I taped the webcam back on to its designated window. Using different types of tape, we are still baffled by why the camera will not stay firmly attached to the hanger window. Chris believes it is a combination of cool air from their swamp cooler and high heat on the outside of the window glass. After I left town, the camera fell from the window, but Chris got it back in business the next day. Thursday, August 18 was my last day in Moab, and I had one new webcam to install. An associate broker at Arches Realty in Downtown Moab had asked me to come in. After quickly deciding on the best view, I began installation of their new webcam. Six hours later, I had the webcam tested and showing a great image of Moab and the Redrocks from their first story window. Alas, a year later, the company asked me to remove their webcam. The image below is the last surviving image from that webcam. Before I left her office, an associate broker invited me to review all of the MoabLive.com webcams on her computer screen. On the screen we could see a thunderstorm raging at Canyonlands Field, about fifteen files north of our location. A quick glance at our several Spanish Valley webcams showed increased weather activity all around. The Slickrock had clouds, thunder storms cloaked the La Sal Range and the flag flew almost straight up near the Moab Rim. From our vantage point at the computer, we could see thunder storms coming and thunder storms blowing away. Looking at that spectacular sight, we were awed by the breadth and power of nature in and around Moab. Approaching as it did, from the north; the storm first hit Canyonlands Field, and then moved on towards Moab. As the airport-thunderstorm collapsed, it sent a torrent of cold air south, along the Moab Rim and down the U.S. Highway 191 canyon. There, the venturi effect created by narrow canyon walls accelerated the wind. At the Potash Road, the canyon widens again, thus allowing the wind to fan out over the top and sides of the Moab UMTRA site. The rounded shape of the Moab Pile allowed a low pressure zone to develop over its top. Behaving like a giant airplane wing, wind gusts entering that low pressure zone launched tons of radioactive and toxic soils into the air. The heavier particles (and presumably the heavier radio-nucleotides) quickly fell back to earth. With the UMTRA's direct adjacency to the Colorado River, I am sad to report that the river received a heavy dose of radioactive dust and chemical toxins, as released by the ensuing dust storm. It is always good to remember our downstream neighbors. In this case fourteen million American and Mexican citizens living downstream rely on the Colorado River for drinking water, manufacturing and crop irrigation. As sad as these facts may be, The Dust Storm of August 19, 2011 did not end there. Writing later to a Moab friend, I said, “By the time I got to a gas station on the south side of town, a gale of dust and trash swept over me. When I arrived home at the Moab Rim RV Campark, farther south, I went down to the rail fence and took some pictures. From there, I could see wind ravaging the Moab Pile and sending tons of radioactive dust toward Downtown Moab. From the pictures I took, it is obvious that the UMTRA site is highly vulnerable to winds streaming down-canyon past the Arches National Park entrance. Near that location, the canyon both narrows and deepens. The resultant squeezing of the air creates a venturi effect that is focused on to the northwest side of the pile. Since the UMTRA removal efforts expose more raw soil daily, it easily went airborne and precipitated out as dust throughout the City of Moab and the Spanish Valley. Simultaneously, a similar, but larger dust storm was tearing up the land in Phoenix, Arizona and all of Maricopa County. Was that mere coincidence, or is there a definable connection between those two dust storms? Only if the DOE and the National Weather Service (NWS) cooperate and share data on such events will we begin to predict their occurrence. In this case, I suspect a weather front that stretched from Canyon Country, Utah to Tucson, Arizona. Perhaps someone of knowledge could check and correlate the timing of regional dust storms throughout the Four Corner States. Even without coordinated dust storm alerts, UMTRA contractors can now monitor nine public webcams situated around Moab and the Spanish Valley. If they were to monitor only one screen provided me as the Moab Live Public Service Webcam Page, UMTRA contractors could see a windstorm coming long before they felt it. Greater Moab has many micro-environments and each has its own unique micro-weather. If Uranium King, Charles (Charlie) Steen (1919-2006) had foreseen the long-term threat that his company created, I doubt that he would have situated his Atlas Uranium Mill (now UMTRA) at its current location. With the ongoing threat from flooding and wind storms, old Cold War fears still haunt the area around his creation. The drill rig shown abandoned below the Moab Rim is of the type borrowed by Charlie Steen to make his Mi Vida Mine discovery. In fact it may be the exact same rig. In those days, and for many years thereafter, mining trucks and equipment were often abandoned around Moab. Those who brought this piece of Moab memorabilia to its current location carefully jacked it up on to several railroad ties, removed the wheels and drove away. Now, forty or more years after its derelict arrival, the machine slowly rusts away. At the rate of current decomposition, I estimate its half-life to be about 704 million years, which coincides nicely with the half-life of uranium-235 which it was used to discover. I have not read the Department of Energy’s (DOE) charter of the UMTRA Moab Project, but there must be something in there about using every reasonable and cost-effective method of protecting the Moab Pile from flooding downstream or blowing away in the wind. We know from previous studies that deep beneath the Moab Pile there is a large reservoir of contaminated water. In fact, the center of the pile is so wet that the latest Google Earth view of the UMTRA site shows a recently uncovered stream bed. Water beneath the Moab Pile has only two places it can go. If allowed to, it will migrate downstream towards the Colorado River. In fact, a well-field along the riverside attempts to extract contaminated ground water and spread it atop the pile. As the water slowly dries on undisturbed parts of the pile, it forms a tough crust. With so much of the site under recent excavation, very little of the ground stays undisturbed for long. As a result, much of the UMTRA site is unprotected from another big “blow off”. The DOE should require the contractor to take immediate action to design and deploy a far larger array of sprinklers at the site. Ideally, an onsite reservoir would feed the sprinkler system, which could quickly cover the entire pile. With better weather monitoring and forecasting, the contractor could start deploying large volumes of sprinkled water ahead of the next dust storm, rather than afterwards, or as on August 18, 2011, “not at all”. Whoever monitors the weather and calls for future halts in work at the site should be an employee of the NWS, not the DOE or the contractor. When danger lurks for the Moab Pile, no one should second-guess an early weather-shutdown, rather than a late one. In the current situation, shutting down “on time” is often too late. Many in Moab grew up with or within the nuclear industry. Despite the toll it took on mine workers and processors, Moab is tolerant to the point of nostalgia about its ranching and mining past. That familiarity may breed complacency, which Moab can ill afford. Even if many residents consider a nuclear dust-bath to be an acceptable occurrence in town, most tourists and visitors do not. The only way to assure the safety of all in Moab is to take immediate measures to change the Moab UMTRA charter, making environmental protection at least as important as removal and transportation of contaminated material.